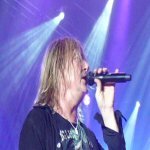 Def Leppard singer Joe Elliott was interviewed on Monday by Eddie Trunk and talked about a second Vegas residency and the 2015 album/tour plans. Joe talked about what he's been doing recently, working with Ricky Warwick on his solo album Hearts On Trees, Slang Deluxe Edition/the original album and tour, ownership of their albums released since 1993, ongoing issues with Universal, live backing vocals, second Vegas residency for Pyromania, the 2015 studio album, playing new songs live/Ded Flatbird, the 2014 KISS/Def Leppard tour setlist, the Down 'n' Outz second album 'The Further Adventures Of...', 'Rock And Roll Queen' single and the proposed third album. Joe said the second residency may be delayed until after the 2015 tour for a new album or it may happen next year if they can fit it all in. He also said the new material is "really strong". "Well I don't know because I think the joke might wear thin. Also it's a totally different animal because looking at VIVA! Hysteria when you tag on the nice big long intro and we do the Steve tribute for the beginning of Gods Of War which extends the song and then a couple of Pyromania songs for an encore. You're looking at about an hour 20 an hour 25 for that headline set. And it was the perfect opportunity to play for 45 minutes like an opening act would before we went in to do VIVA! Hysteria." "With Pyromania the album is 42 minutes so you can't really do that and say that you've just done a full spot. So I think we'd have to kind of - I mean I'm making this up as I go along because I don't know how we're gonna really do it - but I would imagine we may have to do it the way Pink Floyd used to do Dark Side where you just take a little 20 second breather and then just launch into the whole album right in the middle of one set. I don't know." "No, not at all. We were kind of in our minds we were thinking we might do it at the end of this year. We might do it at the beginning of next but things have happened in the Leppard camp since you know we thought about it. That have kind of influenced us to maybe even nudge it even further away because we got together here in - I finished the Down 'n' Outz album at the end of January and literally on the 1st Feb all the Leps turned up at my place here in Dublin and we set about recording and writing for a month thinking we'd get maybe three/four songs on the go. And we've actually got 12 cooking right now. Three of which we could release tomorrow. They're finished as it were but the others are in various stages of undress. You know some of them have got melodies but no lyrics. Some of them are purely instrumental and need a lot of work which we can do this summer while we're on the road." "Pen and paper stuff is easy. It's the studio stuff that you need to be in the one room and work it out with eye contact and stuff. But because we've got that many songs on the go this was a band that a year ago thought we'll probably make another record and we'd just throw out the odd E.P. now and again. We're kind of really excited about making a new album.. So after the KISS tour's finished and I've done the Black Star Riders second album we're gonna start working on you know finishing the album off because they're also gonna be here in May. We're gonna do some more recording in May. So that'll nudge the recording session on that little bit more and then hopefully we can have a new record out for next Spring and if we do that then we'd be probably more interested in touring new music than going in to do an album that's 30 odd years old. So we'll just have to see. We may be able to do everything. It's all down to timing. But at this moment in time we've really got our tails up because of the fact that we've just got so much more new music on the go than we thought that we would in such a short time. And it's really strong. That's the thing that's really excited us all. We've got some really good stuff on the go."